Identification: Hindwing margins are scalloped; fringes are completely dark brown. 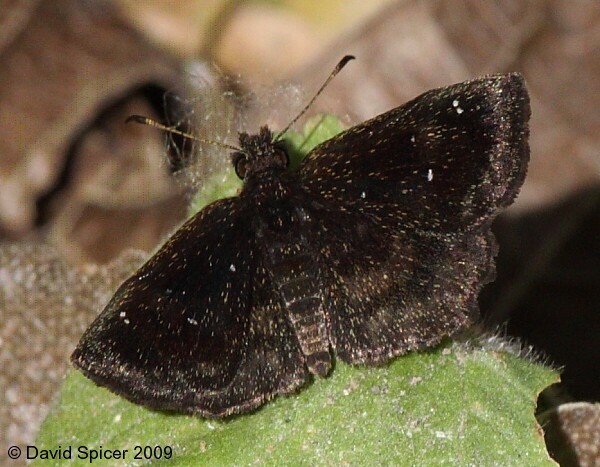 Upperside is black with 2 dark bands on each wing; forewing has a few small white dots near the apex. Wing Span: 1 - 1 3/16 inches (2.5 - 3 cm). Life History: Caterpillars eat leaves of the host plants. Caterpillar Hosts: Lambsquarters (Chenopodium) in the goosefoot family (Chenopodiaceae), and amaranth (Amaranthus) in the pigweed family (Amaranthaceae). Habitat: Weedy areas in parks, small clearings and edges in tropical woodlands. Range: Central Texas south to Veracruz, Mexico.